A regular summer resident and migrant in Minnesota. The Broad-winged Hawk was uncommon during the Minnesota Breeding Bird Atlas (MNBBA). Widely distributed in the contiguous forested regions of eastern and northeastern North America as far west as Texas, Missouri, and Minnesota, and northwest, but sparsely, to British Columbia. This species is rare in open country and not abundant anywhere within its breeding range (Figure 1). An endemic subspecies occurs year-round on several Caribbean islands. Primarily a long-distance migrant to Central and South America, but overwintering populations can be found sparingly along the Gulf coast and in southern Florida. A sit-and-wait predator that feeds on small mammals, amphibians, snakes, large insects, and birds, including nestlings. Usually placed in the first main crotch of a deciduous tree or on a platform close to the bole of a coniferous tree. Breeding distribution and relative abundance of the Broad-winged Hawk in North America based on the federal Breeding Bird Survey, 2011–2015 (Sauer et al. 2017). The Broad-winged Hawk is the most common raptor of the forests in Minnesota. In the late 1800s, Hatch (1892) described it as “fairly common from the borders of Iowa to Lake Superior. Rare in the northwestern sections of the state.” Roberts (1932) more specifically described it as “a common bird throughout the deciduous woodlands of the state and is equally well represented in the coniferous forests farther north.” Even though it is found frequently in the contiguous forests of Minnesota, it can be secretive during the breeding season. Bent (1961) called them “gentle, retiring, quiet birds of the deep forest.” They are very conspicuous during fall migration and are well known for their magnificent fall migrations at Hawk Ridge in Duluth, Minnesota, when tens of thousands can be observed in a single day. Roberts (1932) documented nesting activity in Meeker County (nests with eggs), in Minneapolis (Hennepin County) (multiple nests with eggs or young), and in Isanti (nest with 1 egg) and Stearns (nest) Counties in central Minnesota, and northwest in Becker, Kittson, Marshall, and Polk Counties and Itasca State Park. The latter records were all of nests with eggs or with young. More than 40 years later, Green and Janssen (1975) noted that there were “no summer records for the prairie in the west central, southwestern, and south-central regions, and the species is scarce in the southeastern region.” Although they did not include nesting records, they stated it was the most numerous hawk in the northern forested regions. Several years later, Janssen (1987) reinforced that its breeding distribution is in the “heavier forested portions of the state where there are upland openings and/or wetlands.” He confirmed nesting since 1970 in 23 Minnesota counties, including 1 nest in Brown County in southern Minnesota, and in the Twin Cities metropolitan area northwest to Kittson County and northeast to Cook County. In 1998, Hertzel and Janssen extended confirmed nesting since 1970 to 5 additional counties, including Scott and Winona Counties in the southeast, Kandiyohi in the west-central region, and Kittson and Lake of the Woods Counties in the northwest. During intensive fieldwork, the Minnesota Biological Survey documented 233 breeding season locations. These locations spanned almost the entire state, from the southern tier of counties, such as Jackson (3 locations), Martin (1), and Mower (1), to Roseau County (1) in the northwest to Cook County (>20) in the northeast (Minnesota Department of Natural Resources 2016). Most records were in the northern portion of the state; locations were sparse throughout most of the agricultural regions of southern and western Minnesota. The MNBBA participants documented 959 records, which exemplified the wide distribution of the Broad-winged Hawk, ranging from southeastern to northwestern Minnesota and to all the forested areas to the east (Figure 2). Breeding evidence was recorded in 15.9% (756/4,761) of all surveyed blocks and 18.0% (421/2,337) of priority blocks (Figure 3; Table 1). Confirmed nesting was recorded from 89 blocks, and probable breeding evidence from 115 blocks. Records were relatively dense in the Twin Cities and Brainerd areas, where coverage was extensive, but also in the northern and northeastern portions of the state, where populations are most common. Additional notable records included (1) confirmed nesting in Fillmore and Rice Counties and several possible nesting records in southeastern Minnesota, (2) probable nesting in southern Minnesota in Blue Earth County near the Minnesota River floodplain, and (3) probable nesting in Otter Tail County in western Minnesota with records in Clay and Norman Counties. Johnson (1982), in his review of raptors nesting in Minnesota, noted historical confirmed nesting records in Fillmore and Blue Earth Counties before 1960. The MNBBA probability map predicted that land cover suitability for the species was highest in the northeastern and north-central regions of Minnesota (Figure 4). Lower suitability was predicted on the fringes of these regions, including in the northwest, the Twin Cities’ area, and southeastern Minnesota. Roberts noted the species was common throughout the state and provided nesting evidence from some of the western counties. However, nearly 50% of the forests of Minnesota have been lost since the mid-1800s, and the forest-dwelling Broad-winged Hawk has certainly declined in population with the loss of forests in the southern and western portions of the state. Whether the breeding range has contracted is less clear because observations have been made in the southern regions where some forests still exist, especially in riparian habitats. In western Minnesota, there were no observations in the Red River valley area, which was noted by Janssen (1987). A hint of the past in this area was described by Bent (1961), who cited J. W. Preston’s observations from 1888: “In hidden retreats, where the tangled wilderness of lakes and forests guards in lonely silence the streams which feed the Red River of the North in Minnesota, I found the Broad-winged Hawk . . . breeding abundantly.” The Red River valley on the border with North Dakota has been heavily converted to agricultural land. In their review of the Broad-winged Hawk in North America, Goodrich et al. (2014) did not mention historical changes in habitat loss due to forest conversion to agricultural land but noted the recent increase of this species in the northeastern United States with reforestation. They do suggest the species may be expanding westward into many forested areas in western states, including Texas in the 1970s and Arizona, Colorado, Idaho, Montana, New Mexico, and Wyoming in the 1980s. Breeding distribution of the Broad-winged Hawk in Minnesota based on the Breeding Bird Atlas (2009 – 2013). Summary statistics of observations by breeding status category for the Broad-winged Hawk in Minnesota based on all blocks (each 5 km x 5 km) surveyed during the Breeding Bird Atlas (2009-2013). Summary statistics for the Broad-winged Hawk observations by breeding status category for all blocks and priority blocks (each 5 km x 5 km) surveyed during the Minnesota Breeding Bird Atlas (2009-2013). Landcover suitability of Broad-winged Hawk in Minnesota based on habitat, landscape context, and climate data gathered during the Minnesota Breeding Bird Atlas (2009-2013) using the MaxEnt modeling approach. Broad-winged Hawks have been described as nesting in deciduous and mixed deciduous-coniferous forests (Goodrich et al. 2014). Breeding territories of the species were frequently associated with openings and water nearby, such as ponds or wetlands (Keran 1978; Titus and Mosher 1981). Johnson (1982), in a study in Becker and Hubbard Counties, found 11 nests to be within 288 m of an opening (mean = 79 meters) and within 322 m of a wet area (mean = 141 meters). On the basis of 29 nests from both Minnesota and Wisconsin, Keran (1978) stated that the species used managed forests, including oak and aspen from 35 to 50 years old in areas with an average density of 204 trees per ha. Cadman et al. (2007) commented that the presence of Broad-winged Hawks was well correlated with the remaining large patches of forest cover. Chartier et al. (2013) also noted that this species was not found in the most southerly tier of counties in Michigan, where forest patches rarely exceeded 30 ha. Goodrich et al. (2014) cited evidence that the species prefers larger, contiguous forested areas. Monitoring studies in Minnesota and Wisconsin’s national forests document that the Broad-winged Hawk was found in a wide variety of forested stands. These included aspen, aspen-spruce-fir, jack pine, lowland hardwoods, oak, and white pine; the species was also often observed near open wetlands (Niemi et al. 2016)(Figure 5). Typical breeding habitat of the Broad-winged Hawk (© Gerald J. Niemi). The North American population as estimated by Partners in Flight is 1.7 million breeding adults with 900,000 in the United States (Partners in Flight 2017). In contrast, estimates in Canada alone ranged from 50,000 to 5 million adults (Environment Canada 2014). Partners in Flight (2017) estimated the Minnesota population of Broad-winged Hawks as 70,000 individuals. The MNBBA did not attempt population estimates for Minnesota, because of too few observations. Trend estimates from the federal Breeding Bird Survey (BBS) were unreliable throughout North America because of too few observations in all jurisdictions sampled (Sauer et al. 2017). For instance, counts in Minnesota from 1967 to 2014 averaged less than 1 detection per route, and no state, province, or region averaged more than 1 detection per route. Despite the lack of detections, Partners in Flight (Rosenberg et al. 2016) used the combined data from the BBS and estimated that the breeding population in North America had increased by 53% since 1970. The National Forest Bird (NFB) Monitoring Program in the Superior National Forest found a significant decline in the Broad-winged Hawk of 6.55% per year from 1995 to 2016 (Figure 6). However, the trend was based on annual monitoring in seven forest stands where it was consistently found. The point count method and most breeding count methods are unsatisfactory to adequately estimate the population, so trend data should be interpreted with caution. The NFB Monitoring Program from 1995 to 2010 found 1.33 and 1.95 detections per 100-10 min unlimited distance point counts, respectively, in the Chippewa and Superior National Forests for the Broad-winged Hawk. Based on more detailed breeding studies, Keran (1978) estimated breeding densities of 1 pair per 5.2 km2 in Minnesota, while Rosenfield (1984) estimated 1 pair per 2.4 km2 in Wisconsin. 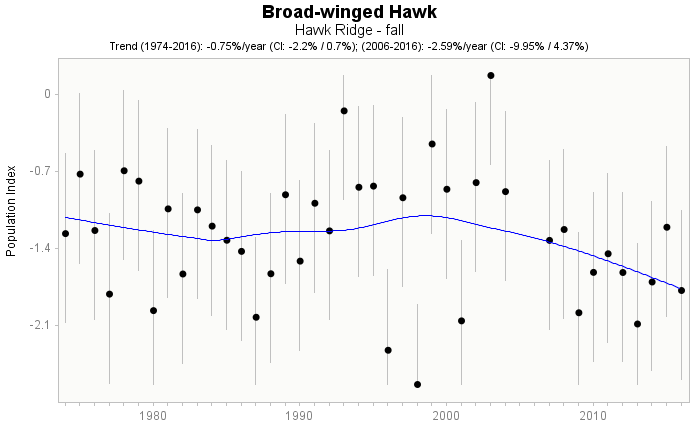 Fall migration counts at Hawk Ridge in Duluth from 1974 to 2016 revealed an insignificant overall trend for the Broad-winged Hawk, but recent counts from 2006 to 2016 have generally been lower although not significant (Figure 7). Because it is unclear where the fall migrating Broad-winged Hawks at Hawk Ridge are migrating from, it is difficult to interpret whether this change is relevant to the Minnesota population, but some of the breeding birds in the state are likely sampled in these counts. Annual fall counts at Hawk Ridge vary considerably, from a total of 9,411 in 1998 to 160,703 in 2003. Counts are highly subject to weather conditions during migration as well as many other factors. 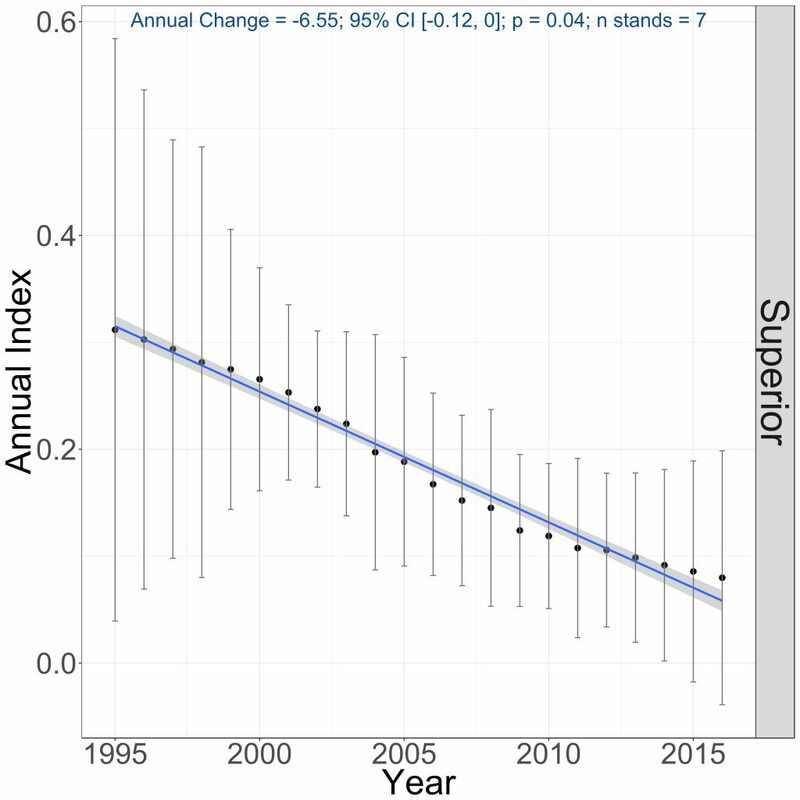 Breeding population trends of the Broad-winged Hawk in the Superior National Forest in Minnesota, 1995–2016 (Bednar et al. 2016). Fall migration counts of the Broad-winged Hawk at Hawk Ridge, Duluth, Minnesota, as calculated by the Raptor Population Index from 1974 to 2016. The Broad-winged Hawk does not have any designations of concern in Minnesota, the United States, or North America. Partners in Flight estimated a low Continental Concern Score of 8/20, which suggests minimal conservation concern. It is likely that loss of extensive forested habitat throughout its potential breeding range since the 19th century has reduced its overall population. However, the species’ range appears to be expanding westward, and recent estimates suggest an increasing population. In addition, reforestation in the northeastern United States has increased populations of the species in that region during the 20th century (Goodrich et. 2014). The past history of the Broad-winged Hawk includes many grisly tales of slaughter. Roberts (1932) describes examples of shooting 102 individuals of this species on September 14, 1924, at Mound near Lake Minnetonka during a flight of 6,000 to 7,000 birds. He also noted another account of at least 3,000 shot at Wheaton and another 1,000 at Herman in Traverse County. These shootings occurred before raptors were protected. Roberts explained that residents of Wheaton and Herman thought they were “performing a righteous deed” in destroying as many of the birds as possible. He suggested that the fact that migrating Broad-winged Hawks “assemble in immense flocks” gave rise to the belief that hawks were still enormously abundant. Large-scale shooting of raptors commonly occurred at Hawk Ridge up until the late 1940s, when Duluth Bird Club members campaigned against the shootings and put up signs at the site. The first formal raptor counts at Hawk Ridge were started in 1951 by Dr. Pershing “Jack” Hofslund, at the time a new assistant professor at the University of Minnesota Duluth. The practice of shooting hawks in the United States has declined following their protected status. Unfortunately, shooting still occurs in isolated places despite the lack of any evidence that this species has harmful effects to domesticated animals such as poultry or pets. Broad-winged Hawks have occasionally been known to capture Ruffed Grouse, especially young, but food studies indicate that grouse represent a small part of their diet. The minor impacts on grouse are far outweighed by the amount of predation on small mammals and insects. Shooting, trapping, and collisions on roads are continued concerns on the hawk’s wintering grounds. Pesticides do not seem to be a concern, because of their current limited use in forested areas. The Broad-winged Hawk may have avoided major population declines during the DDT era because of its reliance on amphibians and mammals for food; increased use of DDT south of the United States may be a concern because of the hawk’s greater consumption of insects in winter (Goodrich et al. 2014). Studies of the impact of increased forest harvesting and management in Minnesota in the early 1990s indicated that substantial increases in harvests of over 4.9 million cords would result in population reductions of this species in the north-central and northeastern forests and statewide (Niemi and Hanowski 1992). The population of the Broad-winged Hawk is currently stable but would be sensitive to extensive forest loss. The species has been confirmed nesting in many areas in the Twin Cities metropolitan area, demonstrating tolerance for moderate fragmentation of forested habitat (North and Faber 2014). Langham et al (2015) and the National Audubon Society (2015), in their review of climate sensitivity by North American birds, labeled this species as “climate threatened.” They suggested that only 27% of the species’ summer breeding range will remain stable by 2080. Keran, Doug. 1978. “Nest Site Selection by the Broad-winged Hawk in North Central Minnesota and Wisconsin.” Journal of Raptor Research 12: 15–20. Rosenfield, Robert N. 1984. “Nesting Biology of Broad-winged Hawks in Wisconsin.” Journal of Raptor Research 18: 6–9. Titus, Kimberly, and James A. Mosher. 1981. “Nest-site Habitat Selected by Woodland Hawks in the Central Appalachians.” Auk 98: 270–281.